Cup competitions haven't been kind to Hassocks in recent seasons so this 2-1 Sussex Principal RUR Charity Cup victory over Crawley Down Gatwick was a welcome result for everyone at the Beacon. The Robins managed just one win out of six in knockout ties last season. The Anvils meanwhile won this competition in 2011 and reached the final as recently as two season ago, eliminating Hassocks along the way. The visitors would have been confident of another cup run had they overcome Hassocks, given that the winners will face either Southwick or Seaford Town from Division One. That opportunity will now go to Mark Dalgleish's side after goals from Phil Johnson and Liam Benson made it back-to-back wins for only the second time since October. The Robins made three changes from the side that had been so impressive in defeating Arundel four days previously. Alex Spinks was suspended which saw Matt Berridge return to the line up while Jack Wilkins Liam Benson dropped down to the bench with Joe Bull and Jake Lindsey taking their places. Hassocks were quick out of the blocks and took the lead after only five minutes. There's a real energy and a strong work rate amongst this Hassocks side at the minute and that is led from Johnson at the front. Needless to say, it was he who opened the scoring. There looked to be a hint of offside about the goal but even so, it was an excellent finish from the forward who is already making a really impact on his return to the Beacon after three seasons away. Down were aggrieved that Johnson's finish had been allowed to stand and they were even more incensed when Sam Cane had an equaliser ruled out for an equally contentious decision midway through the first half. The experienced Marc Pelling headed the ball back to Cane who tucked the ball past Alex Harris. The Anvils were adamant that Cane had run past the Robins' defenders Jordan Badger and Will Broomfield to score but that wasn't the view of the match officials who chalked the goal off for offside. Down were much more of a threat in the second half as they finally got to grips with Hassocks' pressing and Cane put two decent chances over the bar while Pelling saw a header graze the wrong side of the post much to the relief of Harris. With the visitors on top, Dalgleish turned to his bench. Whereas last season it was often filled with under 18 players, here he had three bona fide first team regulars to throw on in Benson, Wilkins and Bant. 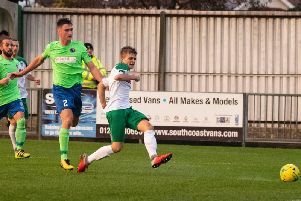 It was the first of those who punished the Anvils for their succession of missed opportunities when he doubled the Robins lead on 70 minutes for his third goal of the season since re-signing from Lancing. Cane did finally get on the score sheet in the 94th minute but that proved to be too little, too late for the Anvils. Indeed, there were no more than 20 seconds between that goal and the full time whistle as Hassocks secured a rare safe passage into the next round of a knockout competition. Hassocks: Harris; Blake, Broomfield, Badger, Mills; Berridge, Slaughter, Stokes; Bull, Johnson, Lindsey. Subs: Benson, Wilkins, Bant (used), Russell, O'Leary (unused).